Earlham Park is situated on the outskirts of Norwich next to the University of East Anglia. Parking is free and the car park can be found at the main park entrance. From there the park, which is basicly a large area of maintained grassland, slopes down to the river Yare. There is an abundance of mature trees around the park, some of which are 600 years old. A good time to visit is in October when there are masses of shiny brown conkers for children to collect. Part of the river has been lined and steps have been built down into it, this has created a safe area for paddling and on a hot day children will be found in the water having fun and catching tiny fish with nets. This is a popular park for dog owners to give their pooches some exercise and to socialise them with other dogs. The Earlham Park Cafe sits on the hill with a pleasant outside seating area looking over the river and the wide open space. Dogs on leads are welcome in the cafe. They have an extensive menu including cooked food, be aware though that they are closed on Mondays and Thursdays. The park is also hired out for some big open air events including a huge fireworks display every year and some music events. It is also used regularly as a 'take off' place for hot air balloons which can be exciting to watch. 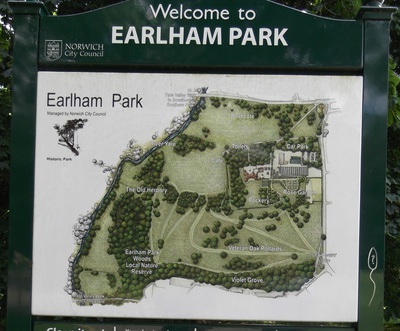 If you live in or near Norwich and love the great outdoors add this park to your 'to do' list.